Americans, we are being conned. We have been trained by the political and media establishment to not see the forest for the trees. If we did, we might very well vote them all out of power. Instead, we buy the myths they sell and reflect them back to the establishment every two years when we go to the polls. And what is the biggest myth? That our growing partisan divide — which is real when viewed across all possible issues — defines our current political state of affairs. Name almost any issue and you will most likely find Americans deeply split along party lines. Transgender rights. Climate change. Gun control. Abortion rights. On every one of these issues, the rift between Americans seems irreparable. And none more so than on immigration. The rhetoric by both political parties on immigration over the past few months has bordered on apocalyptic and has been mostly dishonest. The Democrats cry ‘Racism!’ — though, there is no deterministic relationship between racism and wanting to control a country’s borders. Conversely, the Republicans accuse the Democrats of cultural sabotage and treason — when, in fact, new immigrants from Latin America are among our country’s fastest growing population of new entrepreneurs. Most of what is heard on CNN, MSNBC, and Fox News regarding the migrant ‘caravan’ on its way to the U.S. border is tripe, creating far more heat than light — yet, this issue may well help determine the outcomes in a number of critical U.S. House and Senate races next week. This country is so enormous and powerful, it can absorb the 7,500 migrants like the Borg assimilates entire star systems on Star Trek. Fox News’ Shepherd Smith got it exactly right when he said this week, “There is no invasion. No one’s coming to get you. There’s nothing at all to worry about.” Score one for the Democrats. Sadly, the Democrats are just as mendacious. A nation wanting to control entry and exit across its borders is not manifest racism. It is what countries are supposed to do. Since the Treaty of Westphalia of 1648, controlling one’s borders is part of what defines a nation-state. But this issue is nonetheless going to partially define the 2018 midterm elections. It is unfortunate because, once again, Americans have been duped into thinking immigration policy is going to determine our country’s trajectory over the next few decades. Yes, immigration policy is important and, particularly as it relates to state-level budgetary pressures, sharp attention to our southern border should not be dismissed as irrelevant or used to slander the millions of Americans — both Republicans and Democrats — who believe stopping or slowing illegal immigration is a good idea. The real purpose of the immigration debate, however, is that it feeds the current narrative that Americans are more divided than ever. While true on a superficial level, this narrative cloaks the true nature of the American political and economic system — a system best defined by a bipartisan, durable consensus among the political, media and financial elites regarding the nation’s policy priorities. When researchers recently determined that the policy priorities of the U.S. are far more representative of economic elites’ interests over those of middle class Americans, what they are seeing is this bipartisan consensus among elites. And what are these ‘policy priorities’? As Mohandas Gandhi famously said, “Action expresses priorities.” And nowhere does his quote obtain more relevance than in the U.S. context. And to know our country’s highest priorities, we need only look at how it spends our federal dollars (Figures 1 and 2). All told, our federal government has four priorities: (1) Social Security, (2) Medicare/Medicaid, (3) Defense, and (4) Unemployment Insurance and Income Security programs. In addition to mandatory and discretionary spending, there is a third federal spending category: interest on the national debt. According to the Office of Management and Budget (OMB), the U.S. will pay $363 billion in interest on the debt in 2019, or about half of what we spend on the military ($727 billion). By 2026, interest paid on the debt will double. 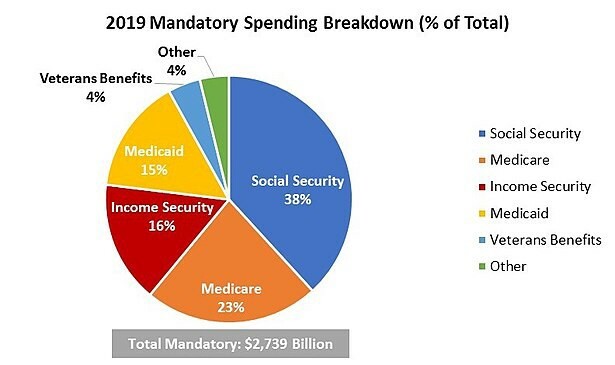 In total, the mandatory and discretionary budgets come in around four trillion dollars, with mandatory spending accounting for 70 percent of this spending. 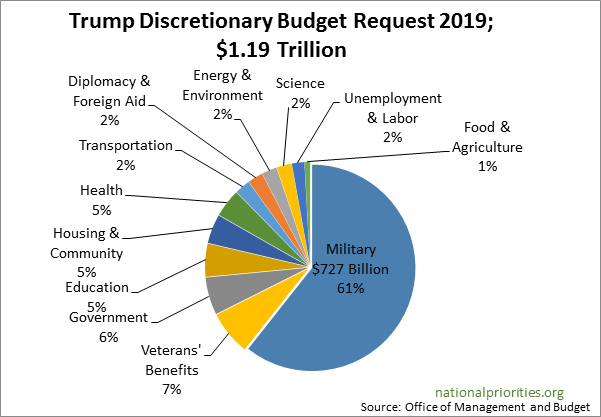 For the remaining $1.19 trillion in discretionary spending, the military eats up 61 percent of the budget, and when discretionary veterans’ benefits are added, it comes close to 70 percent. These budget priorities have defined the American political consensus since 1964, when LBJ passed his Great Society legislation with bipartisan support. For all the heat generated in today’s partisan political environment, when it comes to the major elements of the federal budget, the establishment wings of both parties couldn’t be more bipartisan and cooperative with each other. On an 85 to 10 vote, the U.S. Senate passed the Trump administration’s bloated 2019 defense budget with the help of 38 Democrats. Only two deficit-hawk Republicans, Rand Paul (Kentucky) and Mike Lee (Utah), and Democratic Senators Dianne Feinstein (California), Kirsten Gillibrand (New York), Kamala Harris (California), Ed Marley (Massachusetts), Jeff Merkley (Oregon), Ron Wyden (Oregon) and Elizabeth Warren (Massachusetts) voted against the defense authorization bill. Independent Senator Bernie Sanders (Vermont) also voted against the bill. It is not a coincidence that four of the eight Dem./Ind. Senators who voted ‘No’ are likely to run for president in 2020. Knowing the 2020 Democratic presidential nominee will need substantial support from the party’s progressive wing, the Democrat’s Senate leadership likely released its prospective presidential candidates to vote against the defense authorization bill to enhance their viability in 2020. The result was similar in the House, with 139 Democrats joining the GOP to pass the 2019 defense authorization bill. It is not a mystery why Congress can muster up so much bipartisanship when it generously funds the military or Social Security or Medicare/Medicaid. It isn’t just the political elites who are bipartisan — the American people are equally unified on these issues. You wouldn’t know it by watching the news or reading a newspaper. But it is true — the American people are unified on the nation’s biggest budget priorities (though there is evidence that progressive Democrats and some libertarian Republicans are prepared to tear down the existing consensus). One of the fundamental mistakes made by political scientists and pundits when they observe the significant and growing partisan divide in the U.S is this: they generally treat all issues as equal, which makes Americans look like they disagree on most everything. 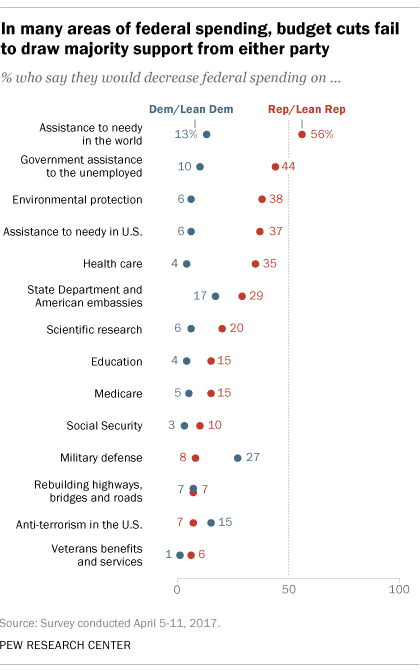 If one were to quantify the opinion gap between partisans across all of these issues, the reasonable conclusion would be that Americans are deeply divided (see Figure 3). Providing assistance to the world’s needy — a 43-point gap. Government assistance to the unemployed — a 34-point gap. Environmental protection — a 32-point gap. But what is more interesting is where Americans tend to agree, regardless of party affiliation: Defense spending — a 19-point gap. Medicare — a 10-point gap. Social Security — a 7-point gap. Figure 3 shows how public opinion is nicely aligned with where Congress places its budgetary priorities. But doesn’t that argue against the conclusion that elites drive public policy more than mass opinion? The 2014 Martin Gilens and Benjamin Page research study I’ve cited many times in my work demonstrates that the strongest causal arrow goes from elite opinion to public policy outcomes. Gilens and Page, in fact, address this criticism in a reply to their critics, published in 2016 in The Washington Post. In their study, even when mass opinion strongly correlated with elite opinion, there was still enough of a difference in elite opinion to show its more significant influence on public policy. Regardless, the current bipartisan consensus on military, Social Security and Medicare spending is real, it has driven this nation’s budget priorities at least since the mid-60s, and it serves — not accidentally — the long-term interests of economic elites. And this latter point gets at why the partisan divide con is hazardous to our democracy. If partisans are aligned on the most important budgetary issues, where is the con? Political scientist Michael Parenti observed over 30 years ago that “the state is more than a front for the economic interests it serves; it is the single most important force that corporate America has at its command.” But to control that force, control must extend to the mass populace that possesses the potential through the democratic process to constrain corporate America’s power over the state. Where Parenti gets too deep into gooey socialist dogma, a more temperate understanding of the American economic system recognizes the significant self-interest economic elites have in propagandizing their policy preferences to the public, particularly to voters. More covertly, especially when the policy status quo is already in corporate American’s favor, there is a strong incentive to distract the general public so they won’t disrupt the status quo through the voting booth. Migrant caravans. A #MeToo take down of another media executive. Fake news. Shadow banning on Twitter. What does Melania’s jacket say again? Russia. Russia. Russia. Stormy Daniels. The con is that we are fighting our political battles over issues that pale in importance to issues such as military spending, an inefficient and costly health care system, or keeping Social Security and Medicare solvent. But hasn’t health care been one of the biggest election issues over the past 10 years? Yes, and it resulted in Congress passing Obamacare in 2009 (along strict party lines), but even its most ardent supporters recognized the program’s flaws and uncertainties would make it vulnerable to dismemberment should the GOP take back control of the government (which they did in 2016— though they failed to subsequently repeal Obamacare!). What defines Obamacare as much as anything is that it doesn’t substantively address the many of the problems in the current employer-based health care system, while it protected pharmaceutical companies from genuine price competition, and did little to reduce the administrative costs generated by private health insurance companies. Obamacare is the type of health care reform you create if you want to protect the vested interests that dominate the U.S. health care system: pharmaceutical companies, health insurance providers, physicians, hospitals and the government. Don’t ever forget this fact — Obamacare was originally a Republican idea. Why did the Democrats fail to truly reform the U.S. health care system when they had the chance in 2009? Because they really didn’t want to reform it. Obamacare focused on the margins where it could have an impact on the uninsured. For the rest of the health care system, Obamacare’s impact has been minimal. It is not hyperbole to suggest that establishment Democrats are heavily influenced by their big campaign donors from the health care industry. In that regard, it is disheartening to look at the biggest U.S. Senate candidate recipients of pharmaceutical PAC money during the current election cycle. Of the Top 20 recipients, 13 are Democrats (see Figure 4). Figure 4. 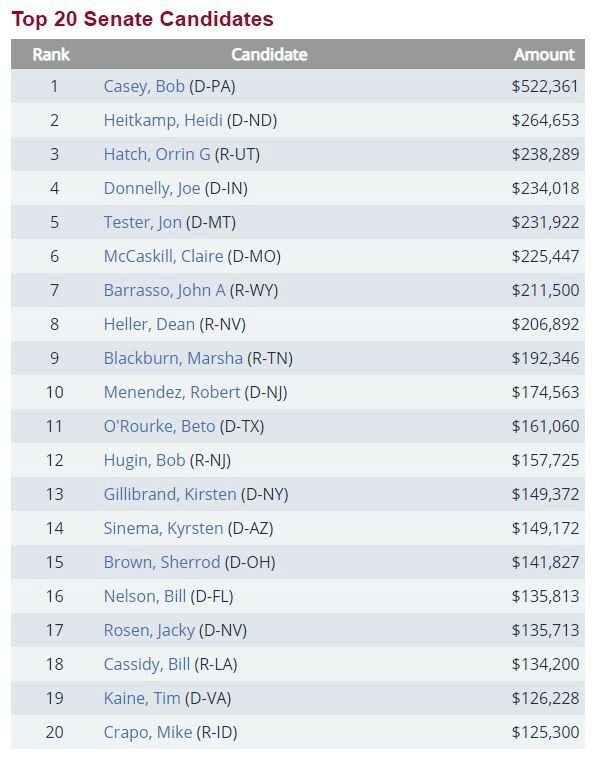 Top 20 Senate candidate recipients of pharmaceutical PAC money (2018 election cycle). Despite what our good-spirited Republican Representative Steve King (New York) calls the ‘greatest health care system in the world,’ the U.S. health care system is inefficient, too costly, and produces inferior health outcomes. We don’t even have the best health care system on the North American continent. Unfortunately, recent history offers no evidence that voting for Democrats will do anything to change that fact. But that is exactly why the partisan divide con is so corrosive — because voters actually believe there is a significant difference between establishment Democrats and establishment Republicans on health care. There is not. It is not just health care system where the status quo has become so entrenched that it is now nearly impossible to reform. Where Bill Clinton gave us the concept of the never-ending campaign, George W. Bush and Barack Obama gave us the never-ending wars. Demonstrating in retrospect a certain degree of moderation when compared to his successor, George W. Bush kept our number of military ground wars and occupations down to two (Iraq and Afghanistan). Ah, those were the days. Obama, on the other hand, jacked that up to seven (Iraq, Afghanistan, Syria, Libya, Yemen, Somalia, and Pakistan) and Trump would clearly love to add Iran and Venezuela to that list. The Obama administration’s lust for bombing Muslims, while feigning its commitment to peace, is a deadly example of how the partisan divide conworks: (1) Convince Americans of your party’s virtue (and the opposition party’s lack thereof), (2) enlist your media allies to promote this false posture, and (3) sit back and wait for the votes to roll in (and possibly even win a Nobel Peace Prize along the way). I’m not even singling out Obama here. The same outcome would have happened had Hillary or John or Mitt been president. When it comes to war, it doesn’t seem to matter anymore who sits in the White House — which, of course, is why the partisan divide con is so important to status quo elites. There are no consequences anymore for bad policy outcomes since they can be drowned out in a sea of partisan rancor and recriminations. The good news, therefore, is that when you go into the voting booth on Tuesday, your vote will not carry the burden of deciding whether this country will continue its never-ending war policy. That policy is already established and locked down. I mean, if killing 40 Yemeni children on a bus field trip is not enough to get the U.S. to stop its involvement in the Saudi/UAE war on Yemen, nothing will. Bipartisanship is a double-edged sword. It is obviously helpful during the legislative stage when garnering votes is critical to a bill’s passage. It’s also important to a program’s survival once it is in place. Without bipartisan support at the start, a yo-yo effect can occur where a program is repealed or weakened once the opposition party takes over control of Congress and the presidency, only to come back again when the other party regains control once more (think: Obamacare). The downside to bipartisanship is that it can be used to preserve the status quo at times when change is most needed. In other words, bipartisanship can make the system less responsive, particularly when the consensus reinforces or promotes the interests of power elites (think: defense spending). This is a lesson for climate change activists who are calling for the fundamental reorganization of the energy economy. By failing to build a broad, bipartisan coalition they all but ensure any climate change legislation that does pass, assuming the Democrats take control of Congress next week, won’t survive should the Republicans subsequently return to power. The frequent cry heard among strong partisans, Democrats and Republicans alike, is that they’d love to more bipartisanship in government, but it’s the intransigence of the other side that prevents it. That simply isn’t true. As this essay has identified, the overwhelming majority of federal spending today is supported by a bipartisanship consensus. Apparently, Republicans and Democrats can get along too. And they’ve being doing for a long time, all the way up to today. Here is what an enduring bipartisanship consensus looks like when viewed from the public opinion perspective. 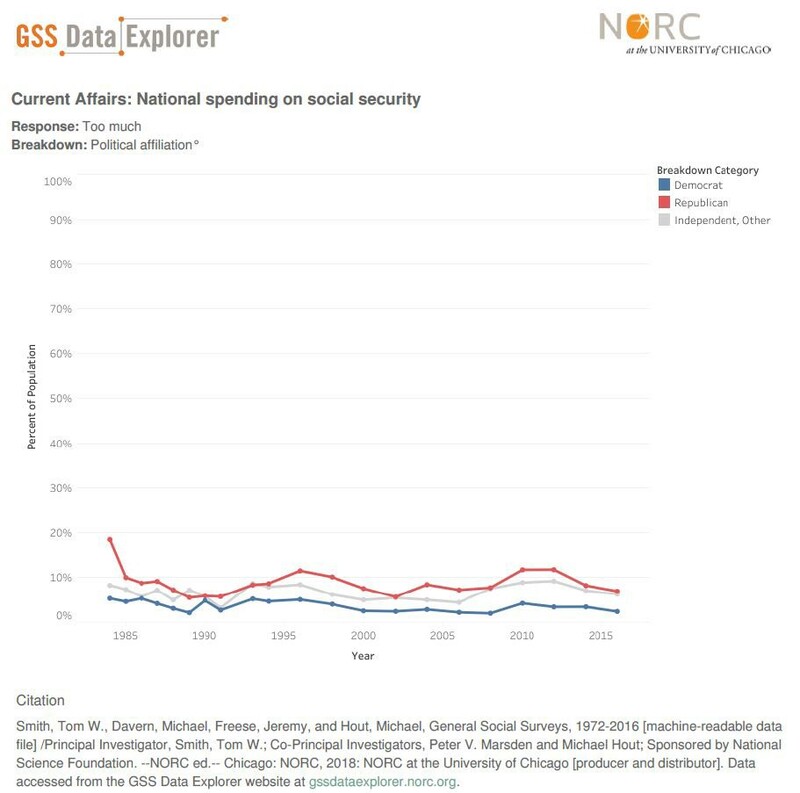 Figure 5 shows levels of public support for cutting Social Security and Figure 6 shows such levels for cutting national defense. As the charts show, since the mid-1980s, public support for cutting Social Security has never exceeded 20 percent, regardless of party identification. This is why cutting Social Security is the third rail of national politics. Figure 5. Public support for cutting national spending on Social Security. Figure 6. 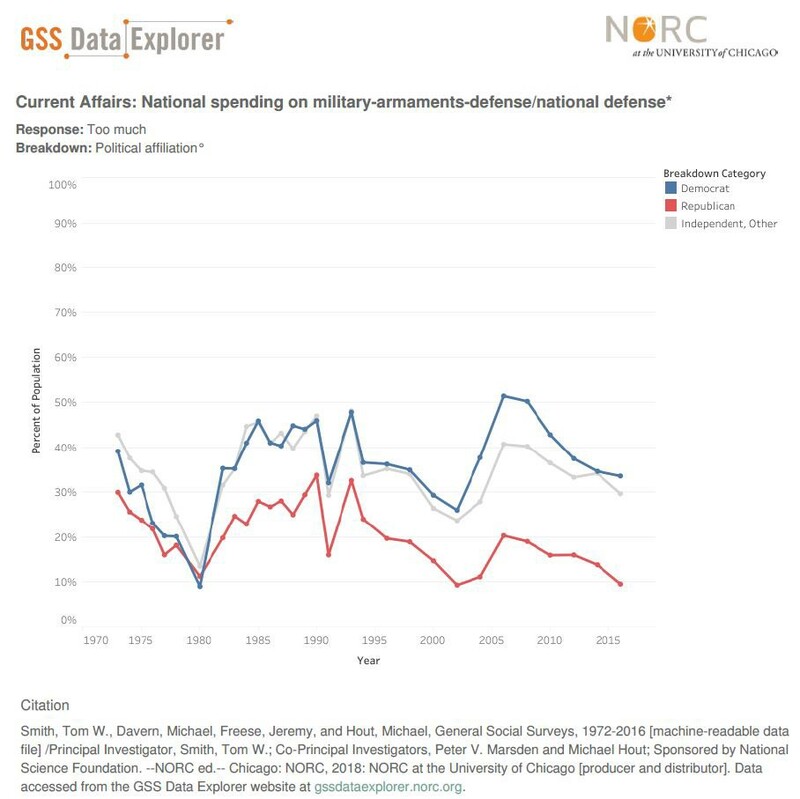 Public support for cutting national spending on national defense. Defense spending is somewhat more complicated. Since the 1970s, Democrats exceeded 50 percent support for defense spending cuts during the Iraq War in the mid-2000s and came close to that level during the Reagan administration. Nonetheless, as a whole, a majority of the American public has never exceeded 45 percent in desiring cuts to defense spending. It is safe to say, large cuts to defense spending are not going to occur anytime soon. The partisan divide con is engineered to make Americans believe they are being offered substantive choices when they go into the voting booth. Unfortunately, in addition to a political establishment that has mastered the art of the irrelevant policy difference to ensure their own re-election, the news media has also learned how to profit from emphasizing partisan policy differences on status-quo-friendly issues. And those that profit most from the status quo — economic elites — are more than happy to let Americans believe a migrant caravan out of Honduras is the most important issue facing Americans today.